Some good people at Lenape High School, New Jersey, USA wrote to me asking if I knew whether Braille copies of She Is Not Invisible were available in America. They’ve chosen the book to be their One Book/One School title for 2015/2016 and wanted to make it accessible to a couple of blind/visually impaired students. The whole point of One Book/One School is to make a book available for everyone in the community to read, after all. Sadly it seemed that there isn’t a Braille edition in the US, so I thought it was worth asking the RNIB over here in the UK if they could help. 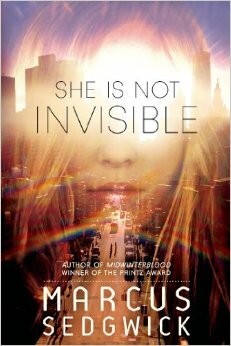 They’d produced a Braille edition for publication day of She Is Not Invisible back in 2013, but I thought there might be some obstacles. I wasn’t sure if UK Braille and US Braille are the same, for one thing, and for another thing Braille books are VERY expensive to make. That’s the main reason why so few Braille books are produced (less than 1% of published titles) and that’s a shame because it is terrible that being blind should stop you from having access to as many books as a sighted person. Yes, there are other options, and yes, not every blind person reads Braille, but when I spoke to various people when I was writing She Is Not Invisible I couldn’t help but feel that some more money to make more books accessible to blind readers through Braille would be very welcome. Fortunately for me, and for Lenape High School, the RNIB are just a truly wonderful organisation, and though their school is all the way over the ocean in another country, they made the decision to gift a Braille edition of the book to the school. (It turns out that UK and US Braille are almost identical: I’m told the differences are only when you come to write it, not read it). Diversity and acceptance. What better goals could we aim for? Finally, the Photography II students at the school made a range of posters to advertise the book around the school, and put together this short video to showcase their work. It’s worth looking at: there are some great interpretations in there, and some cover designers in the making, I think. Finally, I want to say a massive thank you to Cathy Wright, Librarian at New College, Worcester for her ongoing advice when I don’t know something about the unsighted world, to Lenape High for doing such good work with the book, and to the RNIB for their wonderful act of kindness. I would ask them to produce Braille editions of all your books. No one should ever miss the genius of your stories. Thank you to Marcus Sedgwick and RNIB for your generosity! I became a school librarian/media specialist because I want to ensure that every student has the resources they need to grow, learn and thrive. I am so excited to work with ALL of our students and staff in September to discuss “She is not invisible” and to infuse the ideas sparked by the book throughout classes, events and the school community. THANK YOU!!! !